After reaching Gaya, meet our tour representative who will help you with guided transfer to the pre-decided hotel. Complete the check-in formalities and relax for a while. Thereafter, get ready to visit the Mahabodhi Temple. Inscribed as a UNESCO World Heritage Site, the temple is the place where Lord Buddha attained enlightenment. Within the temple complex, you will be taken to the Bodhi Tree under which the Lord gained enlightenment. The site is a major pilgrimage for Buddhist and is thronged by followers of Buddhism from all over the world. From there you will be visiting the Wat Thai Temple. The shrine is unique and only Thai temple in India. Savor hearty breakfast in the morning. Later on, leave for Patna by road. There will be a halt en route to explore attractions of Rajgir - the first capital kingdom of Magadha. It is famed for housing Buddhist ruins, rock-cut caves, shell inscriptions, Hindu Jain temples and forts etc. Also, you will be visiting the Nalanda. Dating back to the 450CE, Nalanda was a Buddhist university. Many of the notable guests of this longest running university in the Indian history were Mahavira and Buddha. After exploring the places, resume your drive towards Patna. Upon arrival, check-in at the hotel. An overnight stay is planned at the hotel in Patna. After having your breakfast, enjoy a road trip to Kushinagar, a Buddhist pilgrimage site. While on your way, visit Vaishali. A small district in Bihar, Vaishali is also a revered Buddhist, Hindu and Jain pilgrimage place. Lord Mahavira was born here whereas Lord Buddha has spent a significant time of his life here. After exploring the Vaishali, continue your journey to Kushinagar. On reaching, check-in at the hotel and relax. 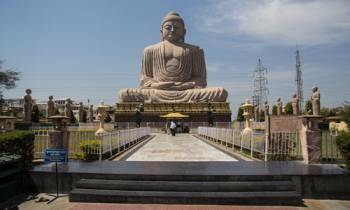 Kushinagar is another Buddhist pilgrimage where Lord Buddha attained Nirvana. Dotted with numerous stupas and monasteries, the sacred place is famed for deriving its name from that of Lord Rama’s son, Kush. Day 4 of the Golden Triangle of Buddhist Tour starts with a healthy breakfast. Post this, get ready for a city tour of Kushinagar. During the day trip, you will be visiting the Mahaparinirvana Temple. The holy shrine is a home to 6.10 m long statue of the Buddha in a reclining position. 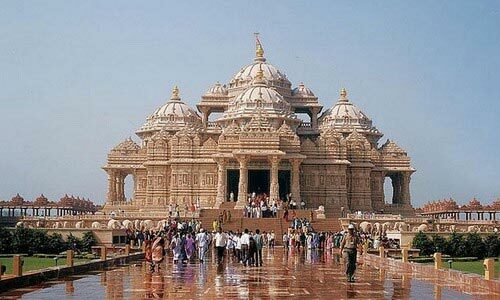 An important characteristic of the statue is that it is made up of a single piece of red sandstone of Chunar. Reckoned as the most sacred shrines of the Buddhists, the temple is visited by numerous devotees throughout the year. Subsequently, you will be traveling to the Wat Thai temple. The temple is so splendid that it can be seen from anywhere in Kushinagar. Attracting tourists from all over the world, the temple portrays the typical Thai Buddhist architectural style. After paying homage, you will leave for Varanasi. After reaching, check-in at the hotel for an overnight stay. The day starts early in the morning as you enjoy a boat ride on river Ganges in Varanasi in the wee hours. Thereafter, you can satiate your hunger with scrumptious breakfast. Post this, visit Sarnath where Buddha preached his message after attaining enlightenment at Bodhgaya. Ashoka adorned this place with numerous magnificent stupas and monasteries. The afternoon is reserved for visiting the famous temples in Varanasi like the Kashi Vishwanath Temple and the Durga Temple. The Kashi Vishwanath Temple is one of the most famous Hindu shrines of Lord Shiva and also houses one of the twelve Jyotirlingas. Painted in red, the Durga Mandir is also known as the Monkey Temple. A holy abode of Goddess Durga, the temple holds great religious importance and was built by a Bengali Queen in the 18th century. A visit to the Banaras Hindu University is also on the list. This is the last day of the tour and you will be departing from Varanasi. In the morning, you will be transferred to the airport to catch your homebound flight. Destinations Covered : New Delhi, Varanasi, Haridwar, Hyderabad..